I enjoy reading comments posted here at my blog. And sometimes a comment is very helpful. Case in point with my last blog post. Sarah gave me a very helpful tip concerning how to add out-of-view objects to my images. And it could not be easier. First, take a look at the image above. It is one of the exported SketchUp images to be used in Photoshop. One of the four screws is out of view and I want readers of the woodworking plan to know it is there (logic would dictate that a fourth screw is there, but I have learned to take as much guess-work out of my plans as possible). The next step is to hide all of the components except the missing screw and the line which shows the path which the screw needs to take. I export this image as well. Both files are PNG files which allow for a transparent background which is important. 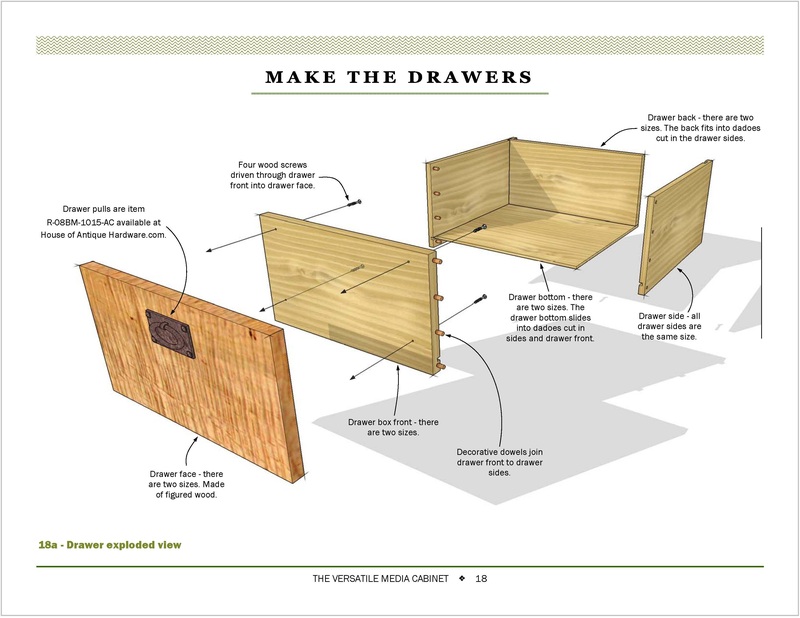 Page 18; an exploded view showing drawer construction. A close-up of the screw and note the arrows added to the original lines. Lots of brain power used to pull all of this off. A close-up of the once out-of-view screw. 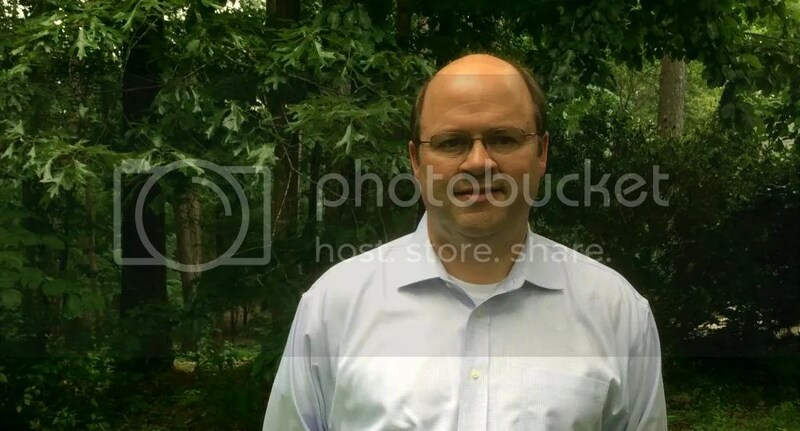 I am going to begin looking into a way to better understand Photoshop. The process of trial and error is very much how I learned SketchUp until I began buying books and watching more specific video tutorials. 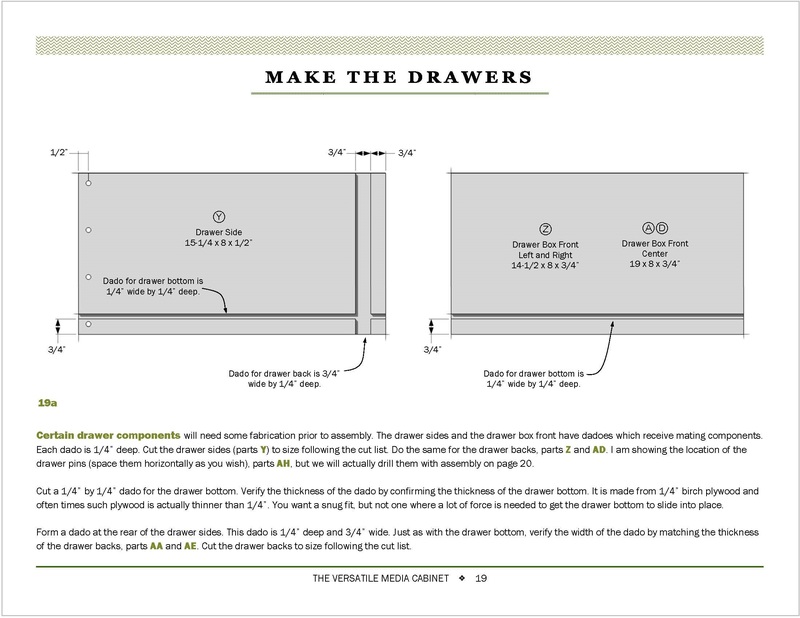 Here are a couple more pages to bring you up to speed on the status of my next woodworking plan; a combination of full color images and grayed ones. I just finished page 20 and will next begin to detail the final steps in construction. Page 19 with gray images. Page 20 which took me about three hours to create. Lots of work required to create this page. With Microsoft Publisher, I have total control over the leaders or arrows which extend from text boxes. I can use a straight, curved or a free-hand line style and then select the line weight, color and even arrow style. Creating these arrows is a whole separate amount of work, separate from creating the image and page text. 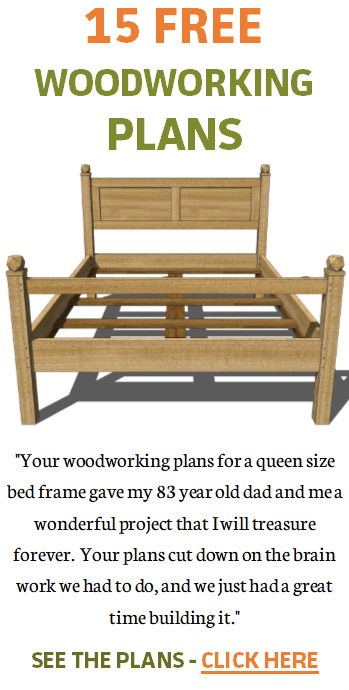 But I am having fun creating this woodworking plan. I hope to have it finished soon. You actually have that software on your computer already. You can take a video of your screen if you have QuickTime installed. In the menu bar at the top one of the drop downs has record screen. You can use your computer mic or an external. It works well but best with an external mic. Love your plans and I think you should sell them they are the best out there buddy. This could be another fantastic tip from a comment. I can’t remember the last time I launched QuickTime. I’ll look into it. Thanks! It’s pretty cool to watch your progress with this. Rock on, Jeff! That’s pretty cool! When I started really learning how to use SketchUp, I realized it’s just another creative building process, and it has it’s own set of techniques that need to be learned and mastered, just like the physical tools! So there’s some learning curve, but the resulting virtual objects are wonderful works in themselves. I still need to review the tutorials every time I want to do anything, I just don’t use it enough to keep my skills fluid. Thanks Steve. You are right about the learning and mastering aspect of SketchUp. I have a friend who is needing help with dovetails in SketchUp. I need to bush up on my skills before I teach him. Looks good Jeff. I know how much work these are. I particularly like the wood grains you add to your models, they are really well done. 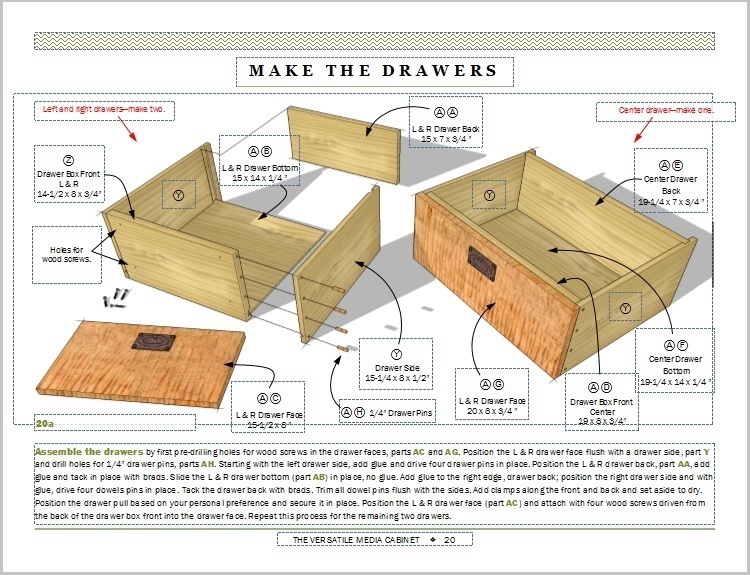 My favorite rendering though is the bedside table, it has a great “feel” or atmosphere. Thanks Tim. I typically search Google images for a good wood texture. I got real lucky with the bedside table; it is an actual photo of the table’s side panel. It worked especially well. Thanks for the posting. You are doing some great work! I drew my bench in Sketchup and then a friend of mine developed the plans in CAD from my Sketchup files. The result is that my bench plans are very good, clear, and professionally done. But! What you are doing is a step above that! The result of your efforts is downright artistic. I’ve looked at MS Publisher a few times, but never realized its potential. I guess now I will have to look more closely! Your work gives me something to aspire to. Thank you Charlie. I have had SketchUp Pro (now about $700) before and it does a lot of powerful stuff for documents, but MS Publisher 2013 was like $115.00 I think. I can get very good results from SketchUp Make (free) and MS Publisher 2013 for just over $100.00. 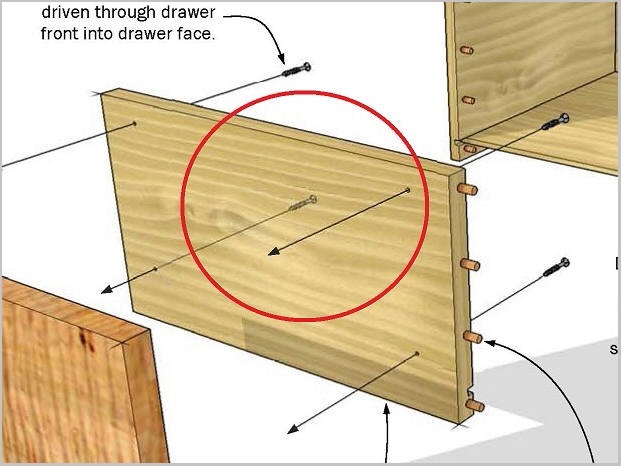 Regarding your comment about brushing up your sketchup skills to make dovetails. 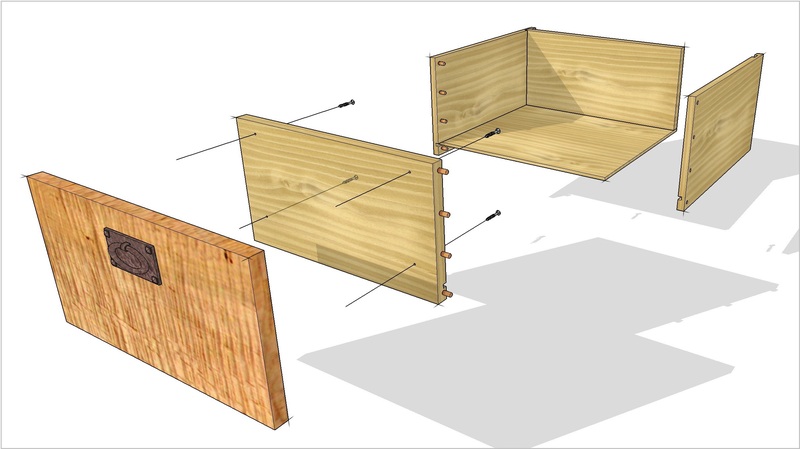 Wudworx is a fantastic plug-in for sketchup for Boards of any size, mortice & tenon as well as Dovetails.